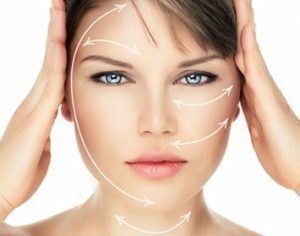 The Perfect Derma Peel, with its mixture of highly effective ingredients, delivers a great skin peel after only one treatment. As well as reducing the effects of hyperpigmentation and melasma, it also removes fine lines and wrinkles. With very little in the way of after-effects, a Derma Peel is practically painless and non-invasive. Peeling happens over 3 to 6 days and thereafter your complexion will appear smoother, revitalised, with a glowing luminescence. Depending on your skin type and skin problem, you may need 2 or 3 treatments with a gap of around 4 weeks in between. During the procedure, there may be a slight burning sensation, or tingling, but this disappears after around 60 seconds. 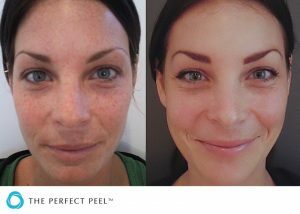 The Perfect Derma Peel only takes 15 minutes to complete and immediately afterwards your skin will redden a little, like a mild sunburn. The Derma Peel treatment can also be applied to the neck, upper chest and hands and to remove acne and acne scars. Used to remove hyperpigmentation – those age and sunspots, and dark patches on the face, neck and hands – a chemical peel is a treatment where an acid solution is applied to the skin that causes it to shed, or exfoliate, and peel off. 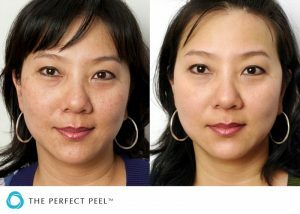 After this kind of skin peeling, the new skin underneath is usually soft, smooth, more luminescent and less wrinkled than the old skin. 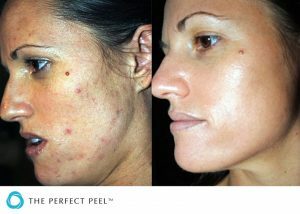 A glycolic acid peel is a common treatment for hyperpigmentation. The peel solution contains alpha hydroxy acid, which is derived from sugarcane, and is a natural, chemical exfoliant that’s water-soluble. 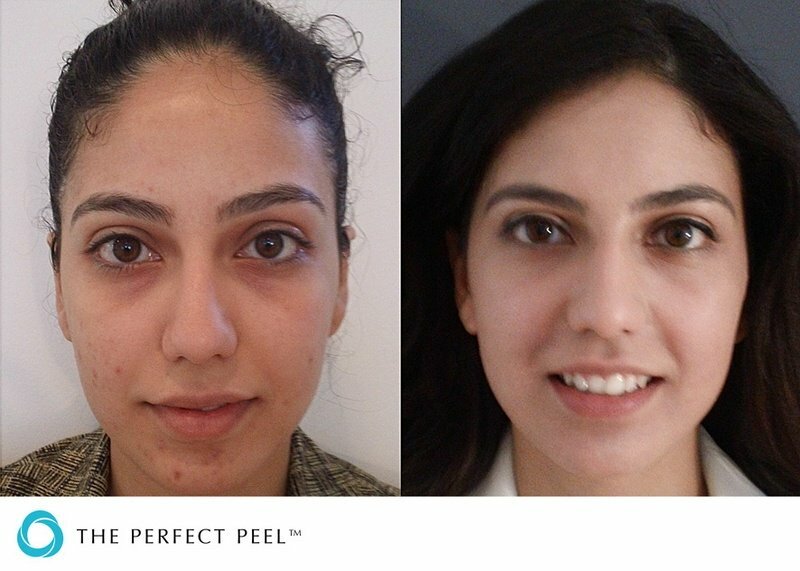 A chemical face peel with glycolic acid is considered safe, and works by gradually peeling away the dark marks, scars and age spots that are caused by hyperpigmentation. The VI Peel Precision Plus Peel is a non-invasive procedure carried out at our skin treatment clinic in Kingston on Thames, London. It’s a safe and simple procedure that removes melasma – those brown patches on your face – as well as age and sunspots. VI Peel Precision Plus Peel is applied as a masque, and is removed after a set period of time – 5, 8, or 10 hours depending on the severity of the hyperpigmentation and your skin type. After the masque is removed, several VI Peel skin products are applied (this follow-up treatment lasts six days with twice daily applications of specialized VI Peel ointments and creams). After seven days, the applications continue but to a lesser degree. Most patients see significant results – dark spots and patches lighten and the tone and texture of your skin will have improved. There are times when the skin doesn’t peel, but that doesn’t mean they’re not receiving all the benefits of the VI peel – new collagen is still stimulated, fine lines and wrinkles are reduced and the overall tone, texture and pigmentation of your skin is markedly improved.